I failed to live up the the first. I could have played my pair of aces, but no…. Ed certainly lived up to the second. This entry was posted in Lunch Time Tichuers on January 30, 2007 by Mark. Next up was a long and meaty game at Great Hall Games. Marty, Adam, Jon, Harry, Brendan, and myself played this game. It was a first for Jon, Brendan, and myself. Although, I have played Manifest Destiny before. I was France and stayed mostly within Central Europe. I didn’t get ships for far too long in this game. I was bummed at the start since one of my cards was a metal card and there were two metal spots next to me. But both Marty and Adam claimed those spots before I could and I could not win them back for quite a while. And this game penalizes you for holding cards and not paying them. You pay triangle points in money for the number of cards that you hold to the next round. So that move cost me more than I made. And later on in the game, when I had conquered all of the region of France, Jon whispers into my ear that he is holding the Black Plague card. Argh! I had forgotten this card and the experience of being almost wiped out by it in Manifest Destiny. … by Jon, in fact! Anyways, I was not in the lead, so he played it against Harry, who was. I also made another mistake once by not keeping enough money to pay to hold my cards. This cost me a misery spot. Misery spots are essentially negative victory points. And, if you get too many of them, you can automatically loose. This was an interesting game. And one that I will play again in the future. This entry was posted in Gaming on January 27, 2007 by Mark. The group went down to Pease park today and there was a little bit of confusion at the start. 10 am was originally proposed. But we always seem to forget about the mini-tournament that starts about that time. So someone else proposed earlier. Unfortunately, no one responded. It seems that the email on the mailing list was congested. I arrived early at 9:30. I thought that, in the worst case, I would just practice for half an hour. Jon also arrived at that time. When we looked around we saw everyone’s cars but no everyone. So we figured that they started without us and we started playing. We finally connected up with the group at hole 4. 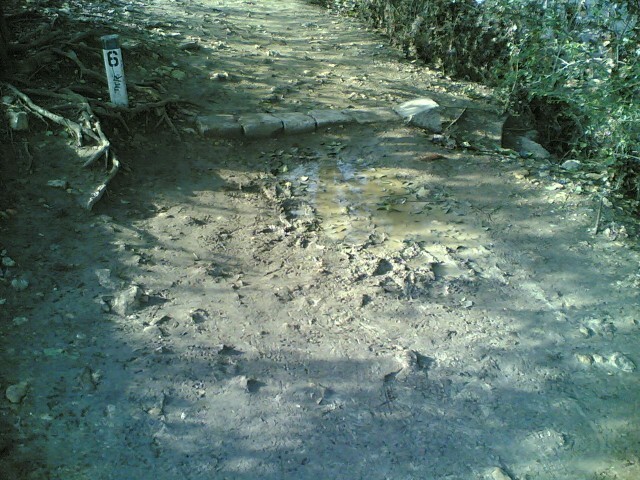 The recent rains were in evidence here. The normally dry creek bed now had water in it. Which John managed to find. And, initially, I thought that that was the extent of it. 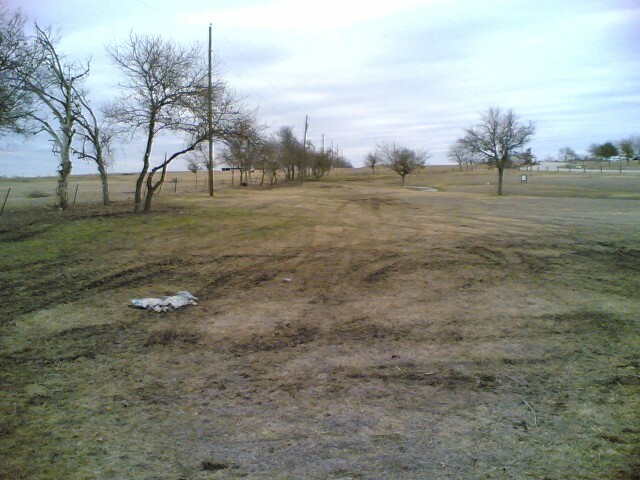 But some of the tee boxes were mud pools. Not fun. And one part of the climb up a hill was deeply muddy. As Adam found out when he almost lost his shoe to the grip of the mud. Marty eventually caught up with us around hole 10 or so after working in the morning. 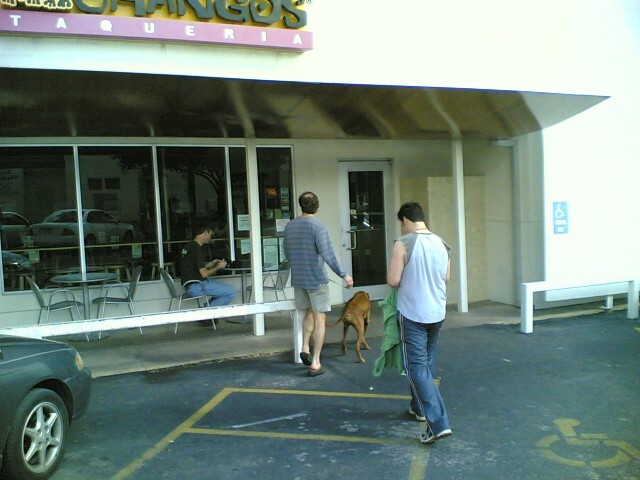 Afterwards, the group went to Changos for lunch. It was a dog friendly in that it had outdoor seating. And the food was quite good I thought. For the fast-food type of restaurant that it was. 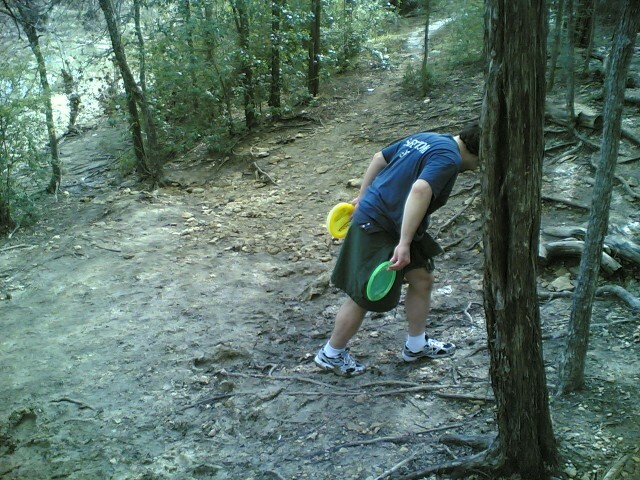 This entry was posted in Disc Golf on January 27, 2007 by Mark. 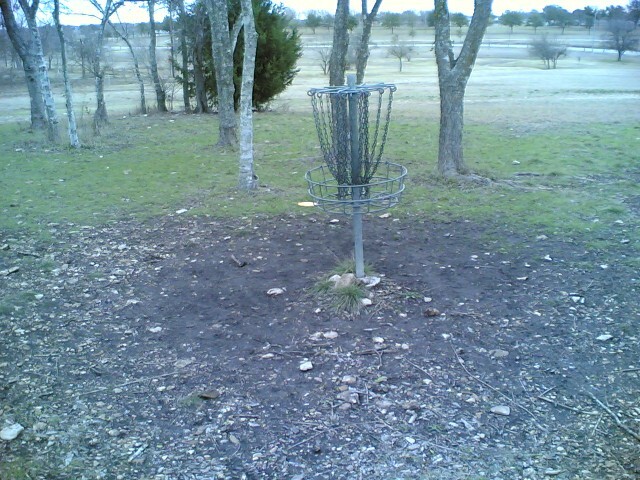 Another round of disc golf at Old Settler’s Park (Winter Course) for me. 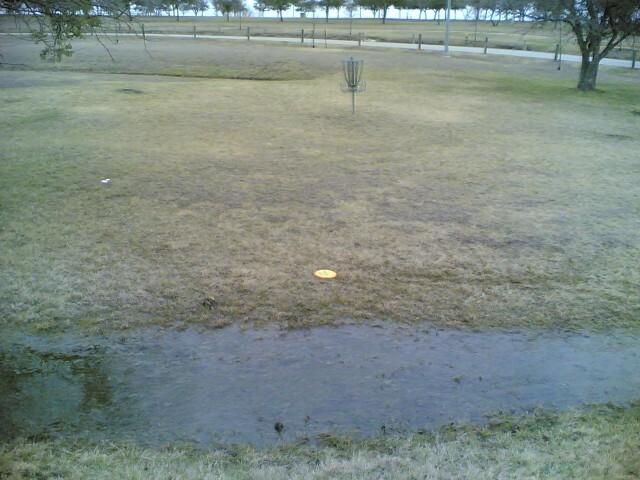 And at least I had two good first throws on holes 8 and 9. 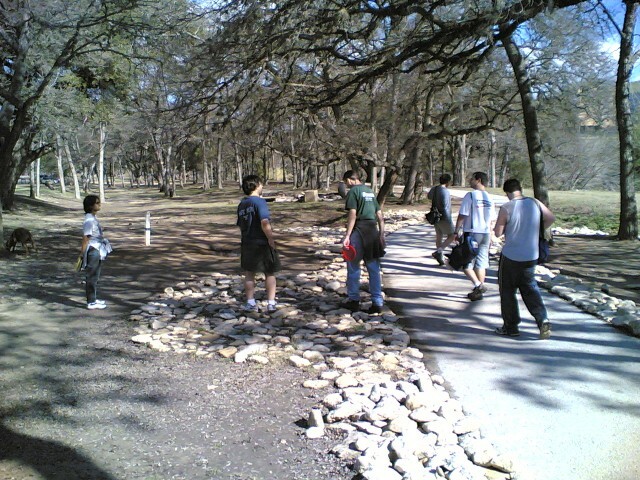 This entry was posted in Disc Golf on January 26, 2007 by Mark. We started out the night with this filler game. And boy were the dice against me! Apparently the rule of the night was not to call. Instead, you were supposed to move the dice up by one. 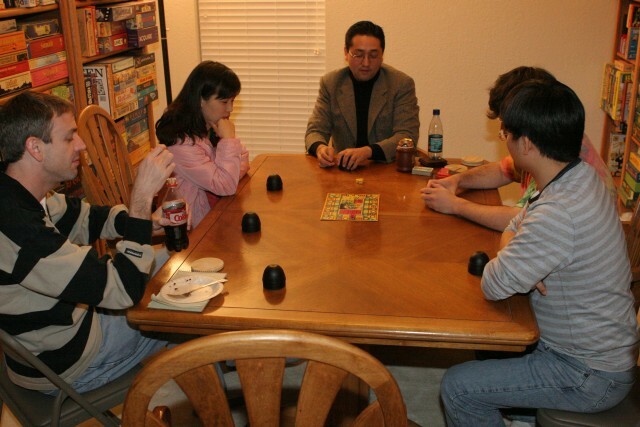 Because there were far more dice under the cups showing whatever number was declared to exist than you thought. Or were probable to exist. 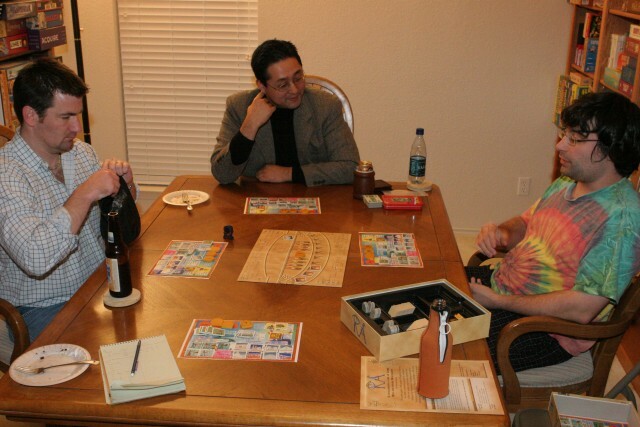 Next up was one of the great Knizia auction games. I started out with low numbers. So my strategy was apparent: call Ra as often as possible. Jon was amused that his numbers were pipping mine. So if I put out my 2, Jon would put out his 3. Or if I put out my 6, Jon would put out his 7. But that only works once. My goal was to get some great tiles cheaply. Adam did have one lucky streak at the end of the second era. 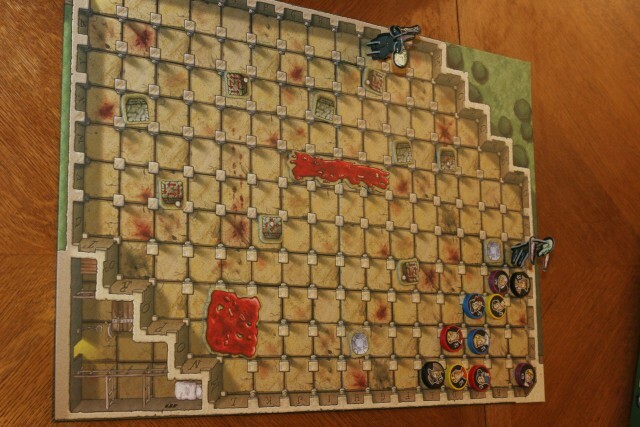 He was the last person active and was able to turn up a number of good tiles to fill up the board. Which he bought. And then turn up a couple of tiles before a Ra tile finally appeared. He then bought those because he was one Ra away from ending the second era. Ugh, while I was certainly happy to play Tichu, I was not happy to be slaughtered at it. First Marty started off well. Then, I caught us up. Next, Jon took us down a peg. And then Adam obliterated me. I called Grand Tichu. Unfortunately, Adam had two length 5 bombs, the Dragon, two aces, and some other card. Pretty unstoppable…. We ended out with another light-weight but fun game. This game is very thematic. You are trying to escape a monster before it eats you. The monster follows some very simple rules. Turn towards the closest person that it can see unless people on both sides are equally close. Move one step closer. Eat someone if it lands on top of them. You have three people that cycle through a maximum number of moves (1/6, 3/4, 4/3). We played this game with the double monster variant. Which turns this game into a shorter and bloodier game. Unfortunately, it was clear that I was going to win. So the group turned to discussing how to stop me. Which I hate. I mean, I am all for each person knowing what to do and making moves to stop the leader. But when one player says “you should move this way to stop this person from winning”, I feel that this ruins the game. It is not fun to play against the group-think. Of course, they stopped me from winning. And Francesca, who was in second place, won the game instead. 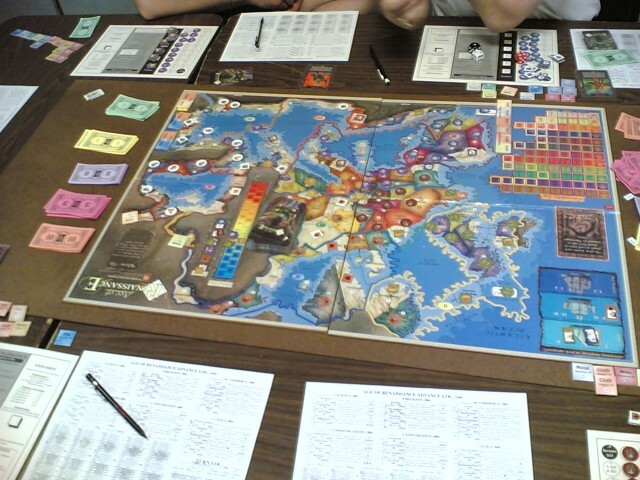 This entry was posted in Gaming on January 25, 2007 by Mark. 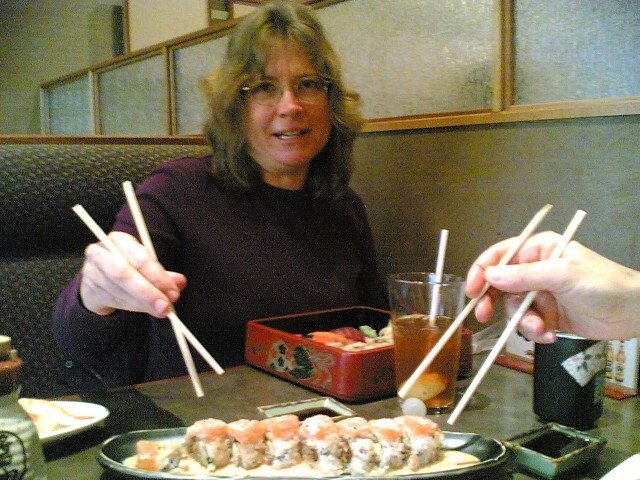 The sushi group went out to Sushi Sake today to try their world famous spicy Susan. We all agreed that Susan was creamy, not too spicy, and more than enough of her to go around. The aftermath was not pretty. 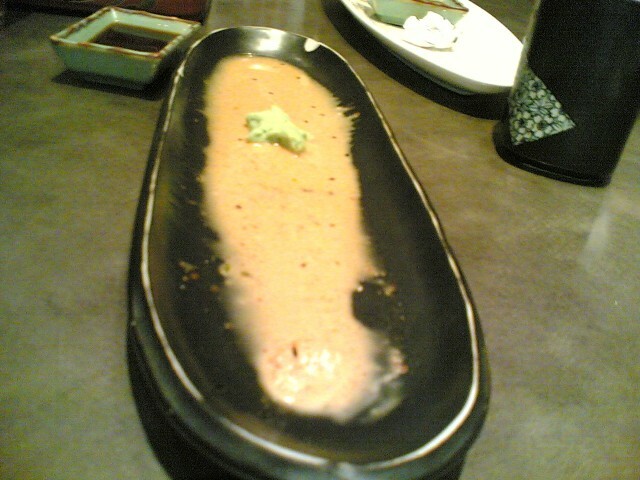 One lone voodoo wasabi figure in a sea of creamy sauce. This entry was posted in Interesting on January 24, 2007 by Mark. Ed’s Grand-Tichu call was a classic case of Grand-Tichu chicken. Its late. The game is almost over. You need to take a chance. And your partner has picked up the rest of their cards. When I had the Dragon, Phoenix, Dog, and one Ace, I knew Ed was in trouble. I was tempted to over Tichu, in fact. But I played it safe instead. Jon did try his best to disrupt us. But he led a single card to Ed when I had the Dragon and Phoenix left in my had. Ed played a King. And I thought about being tricky and playing the Phoenix on top of that. But I didn’t and Dragoned it instead. Adam played an Ace on my Phoenix and went out shortly after that. This entry was posted in Lunch Time Tichuers on January 23, 2007 by Mark. 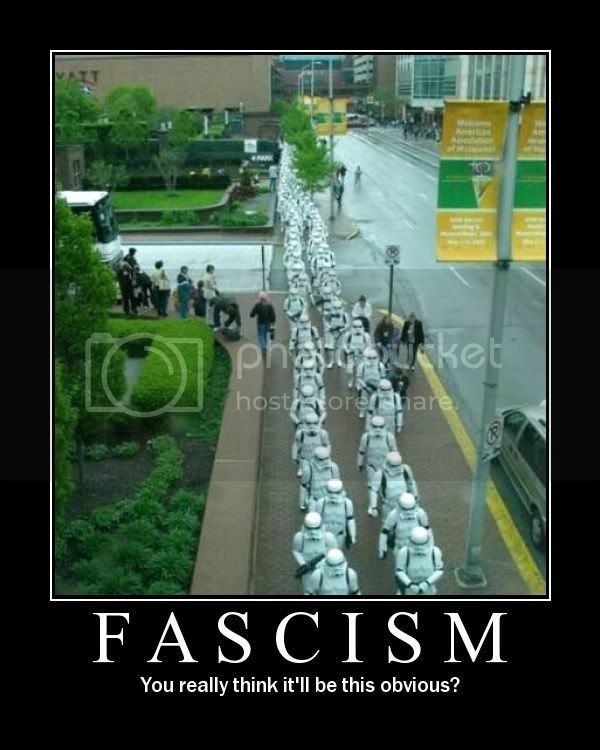 This entry was posted in Web links on January 21, 2007 by Links. Wow, what a beautiful day compared to the cold and miserable ones we have been suffering though lately. Highs in the 60s, sunny and cloudless. Perfect for disc golf. We played the full winter course today. 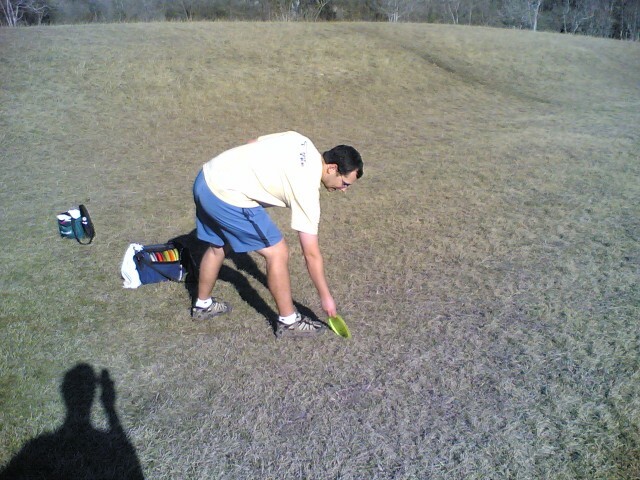 And John tried thumbing a throw on hole 3. Not only did it not go very far. But it embedded itself into the ground. 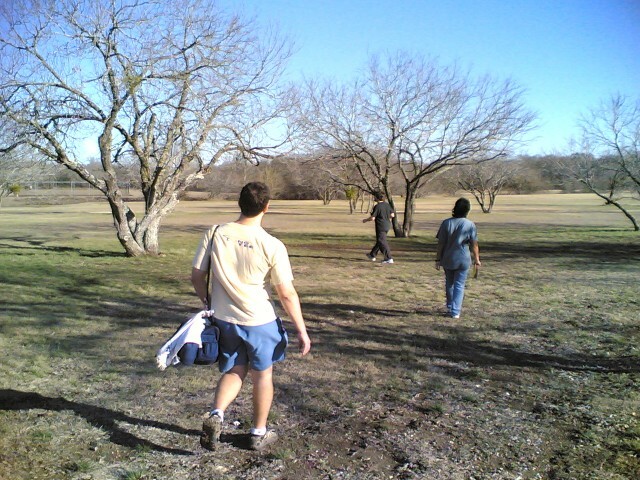 This entry was posted in Disc Golf on January 21, 2007 by Mark. Three of us in the game group are Tichu fanatics. So we usually have to force one other person to play with us. John has been that victim often enough. And apparently it has converted him enough to want to hold a Tichu meetup! He planned on spreading the word to new people. My first game was with Ed, Susan, and Curt. Susan constantly shies away from Tichu games. So today was an excuse to get back on the horse for her. And boy did she start off strong. Four Tichu calls in a row! Ed had the perfect hand to both stop her once and over-Tichu. I was a little worried at the end. The opposing team caught up thanks to Ed’s Tichu calls. But the Tichu and one/two was enough for a knockout punch. Ed and Susan, being the non-Tichu players that they were, went off to play Yspahan. This left us with two tables. I joined Adam, Betty, and Lauren. Betty and Lauren were both really new to the game. So this game was a basic, learn how the game works, kinda game. Lauren was my partner and unfortunately, she did not realize that this is a partnership game. If you cannot, or are unlikely to, call Tichu, then you should pass your best card to your partner in order to help that person call Tichu. So, for the most of the game, I received the third worst card from Lauren’s hand in the pass. The second game was much like the first. I never got a Tichu hand and we got trounced. This entry was posted in Gaming on January 20, 2007 by Mark.